Oh how I’d love to have the land in that picture I used! It’s not my yard. I don’t have a big sunny parcel of land. Because of that, it makes growing vegetables, in our short, New England growing season, tough to do. The sun is scarce in my yard, which is surrounded by tall pines and hardwood trees. My yard is also small. I’m always on the lookout for solutions to these problems so I can grow more crops. This idea of making a raised bed from cinder-blocks is not mine. I saw it in the “Organic Gardening” book. It looks ugly, but it was free to build because I already had the blocks. When I came across an article in the magazine which showed five types of alternative raised beds, the concrete block one jumped out at me. I could do this! The thought of having another sunny spot to grow vegetables stuck in my mind as winter carried on. I would have to lug the blocks up a hill to my front yard because that was the sunny spot. While I waited for the mud to dry up in spring, I watched the path of the sun to decide the best location for my new patch of dirt. Once the garden loam was delivered, I enlisted my teenage son to help me move the blocks – those suckers are heavy! I used the wheelbarrow to fill the space with dirt and some compost, and then planted the rest a tomato and zucchini in there. It’s not a huge garden, but it did give me some extra growing space. This was an experiment for me, and I’m not raised bed savvy. It was a quick fix for lack of garden space and I did get vegetables to grow there. Since then I have learned a bit more about raised bed gardening and am beginning a new raised bed garden (made of wood this time) in my Florida home. An even easier idea is to buy fabric bags and use them as raised beds. They work well for many types of vegetables. It’s a cheap way to build a raised bed too. I don’t think it’s so ugly. 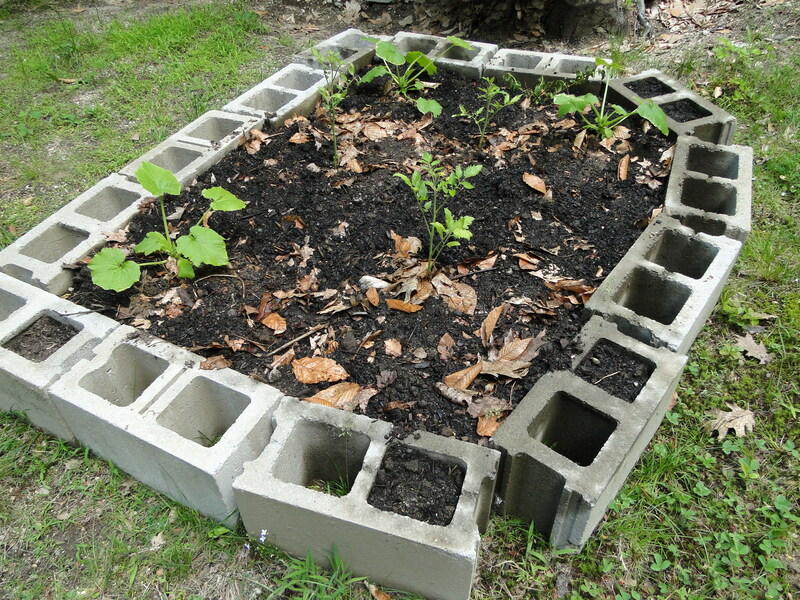 You could plant some flowers in the holes of the cinder block and really pretty it up. That is what I plan to do. I just need to find the time and the right flowers.